From Huddersfield to war-torn Holland, this is the true story of one English boy serving with the Black Watch during World War II. When he was only seventeen, James Watson signed up to serve the nation in the fight against Nazi invasion. Knowing the legacy of their bravery and honour, he expressed a desire to serve in the Black Watch Highland Regiment, and it would only be a few months later when he began his training and the road to war. Written from the perspective of a close comrade, the true-story of James ‘Jim’ Watson’s wartime exploits follow him from his first day of training to the very last battle he would ever fight. Poignantly and emotionally-written, it is a story that conveys the day-to-day suffering of young soldiers as they fought for the liberation of Europe and for the safety of their friends and family back home. Alongside the stalwart men of the 5th Black Watch, James Watson’s actions from his role in the storming of the beaches on D-Day to being amongst the first to cross the border into Germany in 1945 are recollected in vivid detail. Friends dead and innocence shattered, the true cost of war on the young souls forced into violence is powerfully preserved in this account of James’ war. However the question still remains as to whether he will make it home at all. 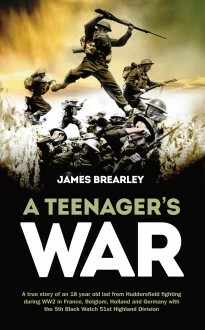 Written by James Watson’s nephew, A Teenager’s War is an inspiring but down-to-earth record of the lives of young soldiers and the war that defined their generation.